Keith Appling scored 16 of his career-high tying 27 points in the first half. EAST LANSING, Mich. (AP) — Keith Appling put together an impressive performance after a poor one. Appling scored 16 of his career-high tying 27 points in the first half to help No. 5 Michigan State pull away and rout New Orleans 101-48 Saturday. 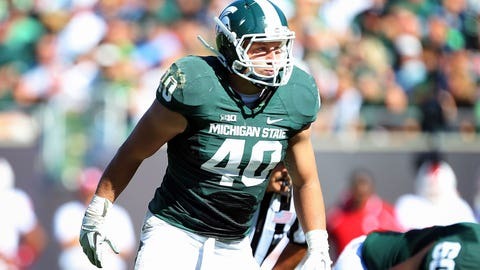 Can the Spartans rally together as a team and overcome the loss of senior linebacker and captain Max Bullough? The senior point guard, playing with a hip pointer, was held to four points on 2-for-11 shooting with just two assists in last week’s 14-point win at Texas. "I was able to get a couple of days off over Christmas break and rest up," Appling said. "That helped my body heal. Now, my hip feels 100 percent." Appling equaled the career high in scoring he set last month against Oklahoma, a fact that didn’t surprise New Orleans coach Mark Slessinger. "Being from the Midwest, I’m still a Big Ten junkie and I watch Big Ten stuff," said Slessinger, who is from Bloomington, Ind. "He’s always been underrated nationally. We didn’t stop him in transition and he played a very, very efficient game." Appling matched a season high with eight assists, had only one turnover and grabbed five rebounds against the Privateers. "The biggest thrill was Keith coming off one of his worst games, really bounced back," Michigan State coach Tom Izzo said. The Spartans (11-1) struggled for several minutes against New Orleans (3-5) before taking control with a 12-0 run midway through the first half. They led 44-27 at halftime and easily added to their comfortable cushion in the second half with 57 more points, finishing with their highest-scoring game since beating Nebraska-Omaha 110-68 two years ago. "Once we got on track, there were some bright spots," Izzo said. The Privateers had won two straight, including their previous game at UTEP. New Orleans’ Matt Derenbecker scored 16 and Cory Dixon had 11 points. "We took some ill-timed shots that were outside of our game plan," Slessinger said. "We wanted to shorten the game and make it almost a little ugly and really try to work the clock and try to get the best shot we could. We got out of our comfort zone and our game plan for this game and that allowed them to make runs." Gary Harris scored 19, Adreian Payne had 17 points and Denzel Valentine had 10 points, a career-high 13 rebounds and six assists for the Spartans in their final tuneup before beginning the Big Ten season Tuesday night at Penn State. Michigan State rested starting forward Branden Dawson because of a shin bruise. "He got kicked in the shin (Friday) on a drill," Izzo said, adding he probably could’ve played Saturday. The Spartans also let center Matt Costello watch one more game even though he was cleared to play. Costello missed his fourth straight game with mononucleosis, but is expected to play a little in the conference opener. Reserve center Kenny Kaminski will be eligible to add depth against the Nittany Lions after serving an academic-related, three-game suspension. "I like the direction we’re heading," Izzo said. "I just need more consistency, but when you don’t get practice with everybody for three weeks, you shouldn’t be totally surprised by the lack of consistency." Harris responded with a poor start against New Orleans with a solid game offensively. The sophomore shooting guard was 0 for 5 before a second straight 3-pointer capped Michigan State’s pivotal run that gave it a 21-10 lead. Before the burst, the Spartans had more turnovers (six) than made shots (four) against a fired-up team aiming for an upset. New Orleans, a Southland Conference school, couldn’t sustain its early success and fell to 7-30 against ranked teams. "We started off kind of sluggish," Appling said. "We didn’t cover things exactly to way we wanted, but the big thing is that we finished strong."